Humans aren't the only ones who find the sweet tang of juicy blueberries delectable. A number of common animals eat the berries as well. You can take various steps, from fencing to sprays, to deter animals from eating the fruits, however. 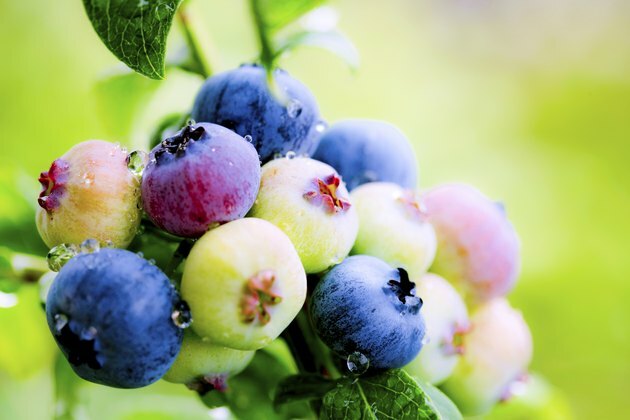 Blueberry plants (Vaccinium spp.) are hardy in U.S. Department of Agriculture plant hardiness zones 3 through 7, depending on the variety. For example, highbush blueberry (Vaccinium corymbosum) is hardy in USDA zones 4 through 7, and lowbush blueberry (Vaccinium angustifolium) is hardy in USDA zones 3 through 7. Close-up of ripening blueberry plant. 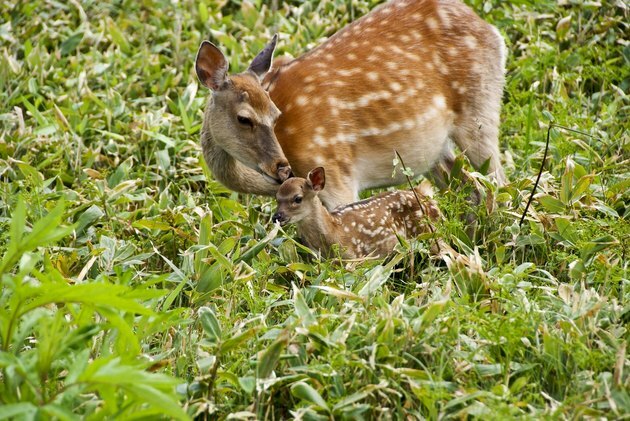 Mother and child deer in field. Deer treat many garden plants as part of a backyard buffet, and blueberries are no exception. White-tail deer eat the berries, leaves and stems, but fencing at least 6 feet high around the plants can help keep deer at bay. Deer can also be deterred by odors that offend their sensitive sense of smell. One option is to hang strongly scented soap bars on posts. Deer also dislike the scent of mint oil, cloves and cinnamon. 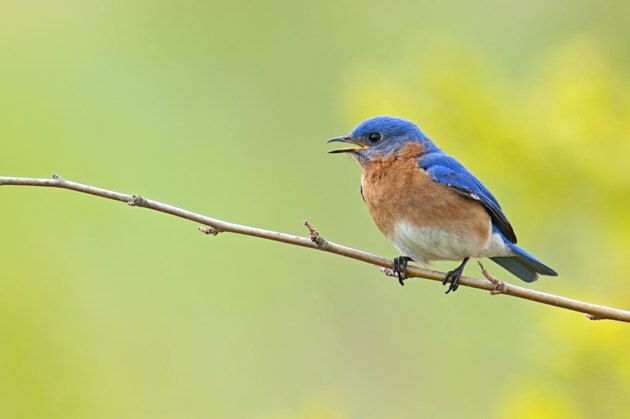 Bluebird sitting on tree branch. Bluebirds, cardinals, catbirds, robins, mockingbirds, mourning doves and wild turkeys all nibble blueberries. One way to keep the birds off the bushes is to protect the plants with plastic netting that has 1/4- to 1/2-inch-wide mesh and that's suspended above and around the plants. The netting can be attached to frames so it doesn't touch the bushes. Shiny, reflective balloons placed around the blueberry bushes may also scare birds away. Wild mouse in the forest. 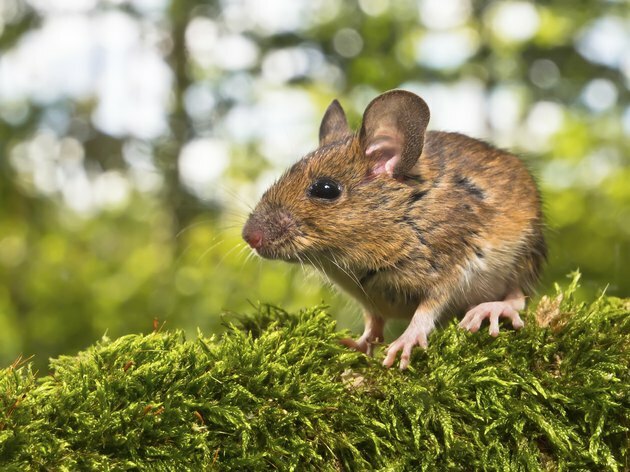 Squirrels, mice, opossums and chipmunks also eat blueberries, but keeping the three smallest of these rodents out of your blueberries without resorting to trapping or toxic baits can be difficult. However, the use of fencing and motion-activated lights may dissuade the nocturnal opossum from attempting to raid your prized blueberry patch. Young red fox in field. 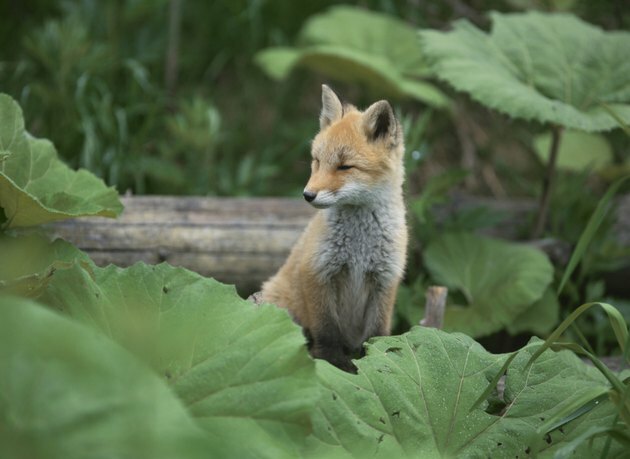 Several additional kinds of animals also eat at least some part of blueberry bushes. Rabbits eat the leaves, stems and berries. Foxes also have a fondness for the berries, as do skunks. Block these animals' access to your plants by enclosing the garden -- sides and top -- with chicken wire fencing attached to a wooden frame. Bears, too, like to search out the nutritious berries, but tall, sturdy fencing may keep them out of the areas where your bushes are planted. What Animals Eat Bean Plants?